Archer's Gold Thyme has bright gold foliage all year long. It is fragrant when it is crushed. Archer Gold Thyme will grow to a height of 1" to 2" tall and will spread from 10" to 12" wide making it and excellent choice for a ground cover or herb garden walkways and in between stepping stones. It will bloom lavender flowers in the summer attracting hummingbirds,butterflies and bees. It will become drought tolerant once it is established. 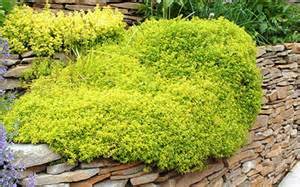 Archer's Gold Thyme is deer resistant and would be a great addition to a Rock Garden or Moon Garden. Archer's Gold Thyme prefers full sun to part shade and likes good drainage. Wet ground will impede growth.